Click on play button to listen high quality(320 Kbps) mp3 of "Adele at the BBC: When Adele wasn’t Adele... but was Jenny!". This audio song duration is 5:28 minutes. 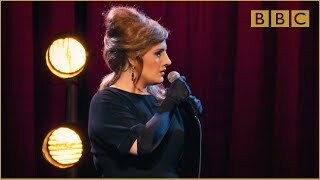 This song is sing by Adele at the BBC: When Adele wasn’t Adele... but was Jenny!. You can download Adele at the BBC: When Adele wasn’t Adele... but was Jenny! high quality audio by clicking on "Download Mp3" button.